Three Rooms Press, 9781941110386, 256pp. An unapologetic, brutal memoir from notorious 60s career criminal James Carr. 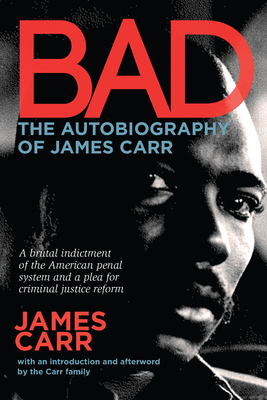 BAD covers Carr's life from his first arrest for burning down his school at age 9, through merciless stints in San Quentin, where he shared a cell with famed Soledad Brother George Jackson, through his tragic post-incarceration murder in San Jose in 1972. A savage indictment of the American penal system, this classic release has new significance as part of a growing, urgent demand for criminal justice reform. James Carr evolved from being one of the most notorious rebels in the California penal system of the 50s and 60s as leader of the infamous Wolf Pack to a comrade of famed Soledad Brother George Jackson and early member of the Black Panthers. Carr was murdered on April 6th, 1972 outside his home in San Jose, CA.